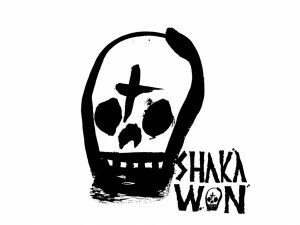 ‘Shakawon’, the second offering from Jozi based Mtkidu, continues the groups’ efforts to change the way music is created and performed. This is primarily done by combining visual elements with the music, which enhance the stories told rather than simply offer a pretty distraction during live shows. This audio-visual combination is carried onto their album which features an interactive multimedia element when it is inserted into your computer. Apart from the links, downloads, press pics and info that give you some insight into the world of MtKidu, there is also a comic, each page of which is tied to a track from the album and which tells a story that links the tracks on the album together. Full review and song downloads after the jump! On to the music. The album opens with the dreamy, aptly entitled Lulluby [sic]. I love Zulu girls is definitely a crowd favourite. It is a slow burner with a grinding bassline, a sharp saw-toothed synth and pounding kick drum, which by the time the chorus hits has most of the kids in the club jumping. Tokoloshi Two Step is more ‘bouncy’ and features the dirty synth sounds for which MtKidu are so well known. Shadow Nation has more of a break-beat. A personal favourite, Walk through Joburg, is a bass heavy track that gets your head nodding from the get-go. She talks in the dark has a strong surreal element, while the beautiful Forest Song is slightly touched by sadness. The album closes with the super fun Kool Klone Kid, another favourite of mine. All in the album covers a large variety of emotions, rather than ‘genres’. The 11 tracks that form the album are a solid selection, which is further contextualised by the above mentioned comic. MtKidu have come a long way since playing in the basement of Horror Café at Secret Parties. If you love MtKidu, you will love this album. If you’ve never heard of MtKidu, but like music that doesn’t follow the same formula that is found in most genres’ I recommend checking it out. You can get the album at MtKidu live shows and you can order it through their website. As part of their album launch, they got several artists to interpret their songs. Below are to of these ‘covers’: The first is by Givan Lötz, who takes I love Zulu girls and changes into an acoustic guitar based folksy-buskeresque song. Ola Kobak takes the already beautiful and sad Forest Song and makes it even more so, creating a piano based ballad, which is bound to give you goose bumps. good work dirty old! catch ya on P-town leg of the tour.be in touch.